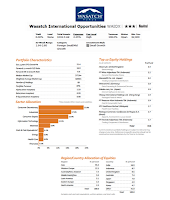 Wasatch International Opportunities fund (WAIOX) is an international stock mutual fund. This foreign small / mid growth stock fund invests in non-U.S. companies. The fund review can be found below. 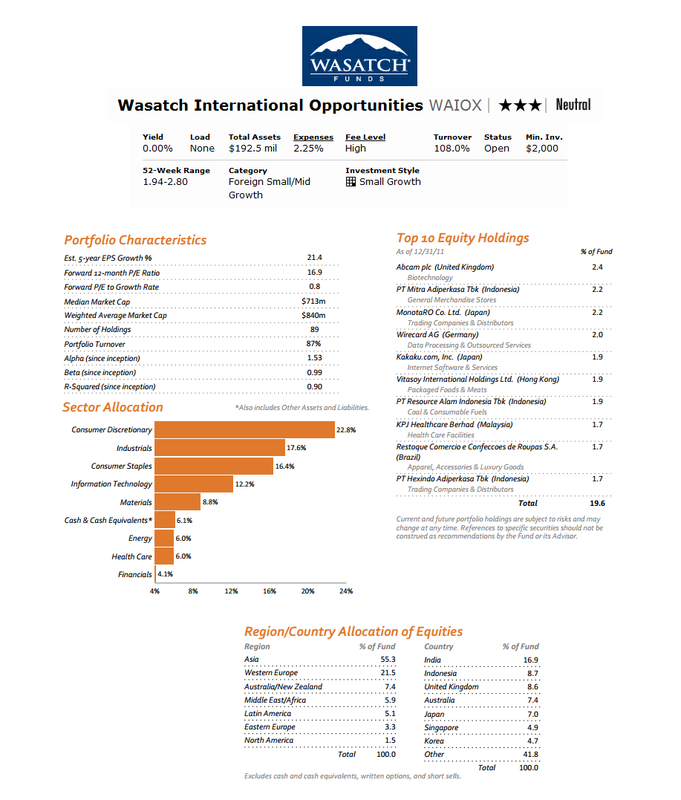 The investment objective of Wasatch International Opportunities fund is to provide long-term growth of capital. This equity fund mainly invests in equity securities of foreign companies with market capitalizations of <$1 billion. It may invest in companies domiciled in emerging markets and in initial public offerings (IPOs). The fund may invest in a few sectors such as industrials, consumer discretionary, information technology, materials, consumer staples, energy, financials and health care. This foreign small/mid growth fund was first introduced to public market in January 2005. It is currently managed by Roger D. Edgley and Laura Geritz. Mr. Edgley is the Director of International Research at Wasatch. This fund has annual expense ratio of 2.25%, which is higher compared to the average in the category which is 1.61%. This is a no-load fund. It means that there is no management fee or no sales charge fee. This fund opens to new investors. The total net assets are $192.47 million. The annual holdings turnover as per May 22, 2012 is quite high (108.00%). Investors, who are interested in this fund, can choose to open a brokerage or retirement account with minimum initial investment of $2,000. The minimum subsequent investment is $100. This fund is available for purchase through 71 brokerages, such as E Trade Financial, Schwab Retail, JP Morgan, Vanguard NTF, Raymond James, Td Ameritrade Inc, Fidelity Retail Funds Network, etc. As of March 2012, the top holdings of this fund are MonotaRO Co. Ltd (2.50%), PT Mitra Adiperkasa Tbk (2.11%), Super Group Ltd (1.91%), Restoque Comercio e Confeccoes de Roupas SA (1.89%), Wirecard AG (1.86%), Abcam plc (1.82%), PT Hexindo Adiperkasa Tbk (1.65%), Yoox S.p.A (1.61%), PT Resource Alam Indonesia Tbk (1.58%) and Domino’s Pizza Enterprises Ltd (1.57%). The top sector allocation is Consumer Discretionary (22.8%), Industrials (17.6%), Consumer Staples (16.4%) and Information Technology (12.2%). According to the fund prospectus, the principal investment risks include stock market risk, stock selection risk, foreign securities risk, emerging markets risk, micro-cap company stock risk, Initial Public Offerings (IPO) risk, etc.